This section of the study reports on findings from three original public opinion surveys, one from each of the three metro areas being studied—Denver, Macon and Sioux City. These surveys probe residents about their news habits, civic engagement and attitudes about the city and the media that serve it. Because each city received its own customized survey, the data are kept separate rather than being combined, and comparisons are made from one metro area to the next. If there is one overarching finding to emerge from the three surveys, it is that there is a pervasive interest in local news across these metro areas. In all three cities, nearly nine-in-ten residents follow news about their local area very or somewhat closely, and roughly half follow it very closely, with Macon showing the highest rates of the three. There is more differentiation when it comes to news at the neighborhood level, as about four-in-ten (41%) Denver residents follow neighborhood news very closely, compared with 58% of Macon residents and 49% of residents in Sioux City. In the ways that residents keep up with and engage in local news, Denver shows some clear signs of greater digital connection. But many news habits are strikingly similar from city to city. Traditional news outlets still dominate, even in Denver, though certain niche or government entities make a mark in each city. Across the three cities, residents comment on news websites or blogs, call into news programs and share news in social media at roughly the same rates. Local government and politics as well as the local economy are discussed often by about half of the residents in each city. And the most civically engaged consistently show a greater connection to local news. Local TV, with multiple channels and news programs throughout the day, has the broadest reach in each city—a reach that far exceeds even that of the local daily newspapers. In both Denver and Macon, residents are about twice as likely to report getting news from local TV as from their daily newspaper: In Macon 66% often gets news from at least one of the four local stations, compared with 36% who turn to the paper, The Telegraph. In Denver, home to nine local TV stations (not including two dedicated sports stations), 58% often get news from local TV, while 23% often turn to The Denver Post for local news. Local TV also outpaces the daily in Sioux City, though not to quite the same degree—68% vs. 40%. The daily newspaper overall hits a much smaller portion of the Denver population (23%) compared with Macon (36%) or Sioux City (40%). Fellow residents also play a substantial role as a source for news. 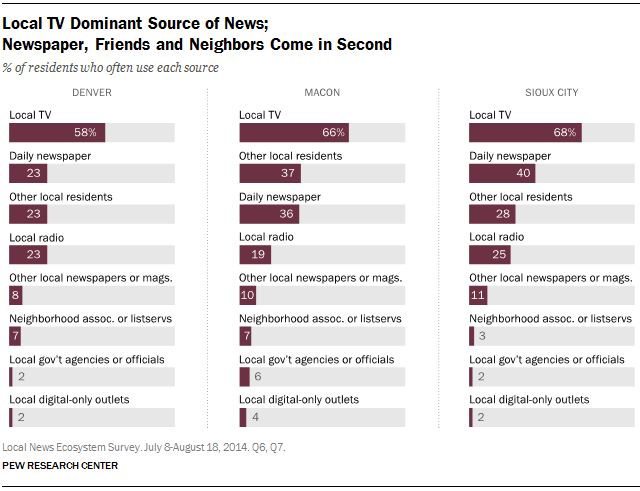 They play the largest role in Macon, with 37% of residents often relying on friends and neighbors for local news, as do 28% of Sioux City residents and 23% of Denver residents. In Macon and Denver, these percentages are on par with the portion of the public who turn to the daily newspaper. Digital-only outlets, neighborhood associations and local government agencies register only in the single digits as sources that residents often turn to for local news. City residents, of course, don’t always turn to one local news outlet to fulfill all their news needs. Instead, they may look to one source for political news and another to learn about local crime. For this reason, the surveys explored news consumption by topic area, particularly when it came to the competition between newspapers and local TV for dominance. Here there are striking differences between Denver and Sioux City, with Macon falling in between. 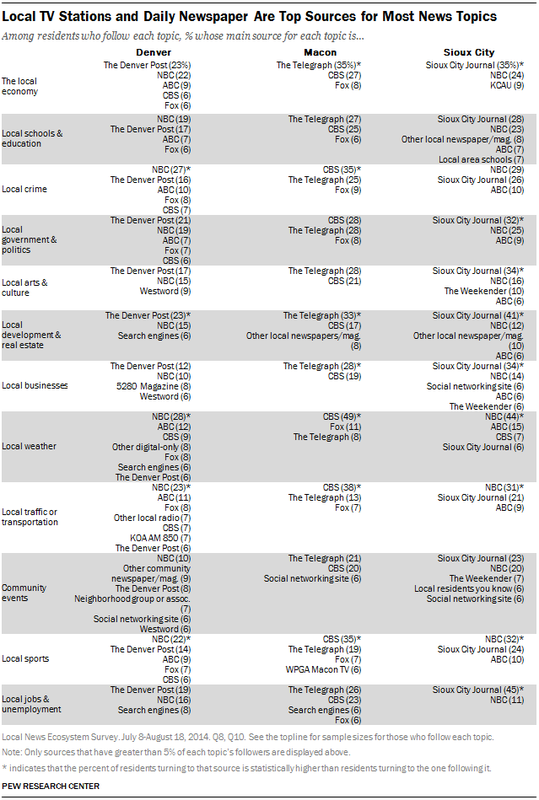 In each city, the daily newspaper and the top-ranking TV station consistently rank among the most named outlets, but where one outranks the other varies by both topic and by city, reinforcing a much greater reliance on the newspaper in Sioux City than in Denver. The Denver Post ranks above the top TV station (9NEWS KUSA, an NBC affiliate) on only one subject—local development issues. It is on par with other sources at the top on seven other issues, including government, the local economy, jobs and unemployment, and local arts and culture. In Sioux City, meanwhile, the Journal ranks above the top TV station in six topics—all of those mentioned above as well as local businesses. Macon falls in between with The Telegraph, outpacing the CBS affiliate on three topics and stands at the top with the CBS affiliate on five others. The topic areas where the leading TV affiliate ranks first are—in all three cities—traffic, weather and sports. In Denver and Macon, the leading affiliate also ranks first for crime. These data also reveal that for many of the topics asked about, Denver residents turn to a somewhat more diverse mix of outlets than do residents in Macon or Sioux City. The Denver Post and local TV networks still rise to the top, but for several topics, smaller outlets also appear. Among those who follow news about local business, for example, the daily paper is the main source for a far smaller portion of residents (12%) than in Macon (28%) or Sioux City (34%). And while the top network affiliate in Denver, NBC’s KUSA, is named as the main source by 10% of those who follow business, other sources were named at almost the same rate, including 5280 Magazine and Westword. Among those following business news in Macon and Sioux City, the top network affiliate garners more than double the following of the next main source that residents turn to. These findings offer an intriguing update to a national survey we conducted in 2011 on local news habits. At that time, newspapers ranked first on seven topics—largely civic oriented—and tied for first on four others. Local TV ranked first for only two topics—weather and breaking news—and tied on two others. The data could not be broken down to a city level, but regionally the findings were consistent. Those 2011 findings line up pretty closely with the current findings in Sioux City but not in Denver. Several elements may be at play here. First is the greater number of news options in Denver. As is evidenced in the table above, for most topics, Denver residents turn to a wider mix of sources. While few of these ever garner a double-digit following, they do add up and could be taking a portion of followers away from the large legacy providers—in this case, the daily newspaper more so than local television. Indeed, as our State of the News Media reports have tracked, average weekday newspaper circulation has declined 11% since 2006 while local TV overall has experienced a much smaller decline in most time slots. In Denver specifically, Denver Post circulation fell 35% from 2006 to 2014 as did circulation for the Macon Telegraph, according to data collected from Editor & Publisher Year Book. The Sioux City Journal had a slightly smaller decline of 29%. Finally, until 2009 Denver was a two-newspaper town with both the Post and the Rocky Mountain News competing for audience. The Rocky’s closure in 2009 coincided with the recession, growth in digital habits and the largest wave of digital only and nonprofit news startups. This does not mean the stories or the news gathering produced by newspaper outlets do not reach people in other ways, but as a primary source they are not as prominent in residents’ minds. Also at play in the connection between residents and news providers is what share of the population follows various news topics. Local weather, for example, is by far the most closely followed topic in all three cities. About seven-in-ten residents in both Macon and Sioux City follow it very closely, as do 63% of Denver residents. Thus, the sources turned to for weather—local TV ranks at the top in each of these cities—ultimately reach a larger portion of the residents. Beyond weather, there is some variation from city to city in the most closely followed topics. In Macon, about half (51%) of residents follow crime news very closely, substantially higher than in the other two cities studied. Macon residents also stand out somewhat from the other two cities for their close attention to what is happening in local schools, the local economy, local government and politics, and local jobs and unemployment. At least a quarter of residents in Macon very closely follow each of those topics, outpacing residents in Denver and Sioux City. In Denver, traffic stands out as disproportionately important to news consumers. Along with crime and sports, traffic news rank high with about three-in-ten residents following each very closely. But, with household income higher than the national overall (40% earn $75,000 or more compared with 33% who do so nationwide) and unemployment rate below the national average, these residents express less interest than Macon or Sioux City residents in local jobs and unemployment.24 Just 12% follow that kind of news very closely, which is about half of that in Macon (25%) and somewhat lower than Sioux City (17%). In Sioux City, the only topic other than weather followed very closely by more than a third of respondents is crime at 37%. About a quarter of residents follow local education and the local economy very closely. Traffic and transportation is of much less interest than the other two cities at only 17% very closely following it. Otherwise, residents of Sioux City tend to be on par or in between Macon and Denver in the rates at which they follow topics very closely. The topic areas that consistently rank the lowest in terms of following them very closely are community events, arts and culture, and local development. Despite the heavy reliance on legacy providers, there are signs in each city of the digital space becoming a part of the news landscape, though its influence varies. About seven-in-ten Denver residents (71%) get local news on a digital device—desktop/laptop computer, smartphone and/or tablet computer—at least sometimes. That is also true of nearly six-in-ten residents in Macon (59%) and Sioux City (59%). And, for almost half of Denver residents (45%), the internet is a very important way they keep up with the news. The same is true for 38% of Macon residents and 33% of residents in Sioux City. (About nine-in-ten [89%] residents in Denver, 76% in Macon and 80% in Sioux City use the internet). Social media is also becoming a part of the digital news experience. Roughly a third of Macon residents (35%) access a news source through a social networking sites, compared with 25% in Denver and 27% in Sioux City. And 8% of residents in each city (roughly three-in-ten social network news users) say that these sites are the most important way they get local news. For newspapers the digital space stands out far more—especially in Denver. The native outlet is still the most popular: 63% of Denver readers, 65% of Macon and 71% of Sioux City readers get news from the traditional paper product. But nearly half of Denver Post readers (47%) access it via the Web, app or email, as do 43% of Macon residents and 37% of residents of Sioux City. Between 13% and 18% in each city access the daily paper via social networks. The Web is obviously the main access point for digital-native publications, though as noted above, very small percentages in each city turn to these kinds of news outlets. For those who do, social media is a relatively popular means of access, especially in Macon. About four-in-ten Macon residents (41%) who use local digital-only outlets access them via social networking sites, as do 34% in Sioux City and 26% in Denver. On social networking sites, much of the local news that individuals encounter comes through friends or other fellow users who pass this news along. But users can also directly follow various types of news providers; of these, dedicated news organizations or individual reporters are the most common. 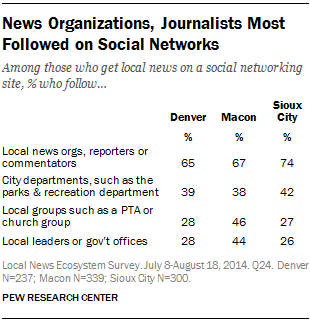 In each city, majorities of those who get local news on a social networking site follow news organizations, reporters or commentators: 65% in Denver, 67% in Macon, and 74% in Sioux City. Other types of news providers are followed as well but at much lower rates. About four-in-ten social media local news users in each city follow city departments. And in Macon, about as many follow local civic groups (46%) and official government offices or local leaders (44%). These groups are less likely to be followed by social networking site users in Denver and Sioux City; only about three-in-ten of social media local news users in both cities report following these kinds of news providers. When it comes to residents’ engagement with news, the similarities across the three cities are strong. At least one-in-five in each city has commented on a blog or website in the past year. Commenting on a local government site, calling in to a live radio or TV show, submitting content to a newsletter or listserv or to a news organization are less common, though each drew activity from about one-in-ten respondents over the past year. Denver residents stand out for the role they play in passing along the news digitally. About half (54%) have shared a story digitally in the past year. The same is true of 40% of Sioux City residents and 36% of Macon residents. In all three cities, sharing a news story digitally is more common than sharing one in hard copy—done by 26% of residents in Denver, 32% in Sioux City and 28% in Macon. Looking specifically at social media, more than half of those in each city who get news on social networking sites often click on links to local news stories (54% in Macon and 55% in Denver and Sioux City). Deeper engagement and sharing, however, is less common. About three-in-ten social networking site news users in each city often share or re-post news stories, images, or videos, and at least 15% often share photos or videos of a local news event that they personally took. Confirming a nationwide truism, at least three-quarters of respondents in all three cities report they often discuss the weather with others. But, residents in each city have conversations about a lot of other local issues as well. In Macon, crime is on par with weather as a topic of conversation. Eight-in-ten residents often discuss the topic. The same is true of 69% of Sioux City residents and just over half (55%) of Denver residents. In all three cities, the local economy and local government and politics are often discussed by at least four-in-ten residents. And while local businesses are not followed as closely as other topics, they are a popular topic of conversation, with about half in each city often discussing them. Residents in these cities tend to have most conversations about local news in person. 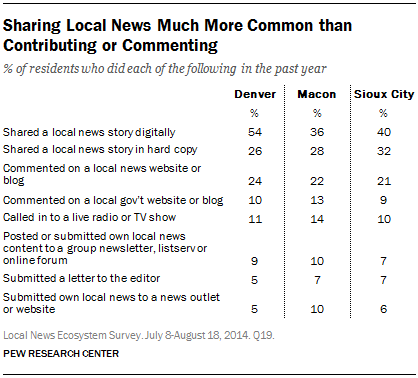 Roughly three-in-ten Sioux City and Macon residents and a quarter of Denver residents discuss local news in person every day. Phone, text, email and social media are all far less common as a means to discuss local news, though Macon residents are more apt than residents of Denver or Sioux City to have a phone conversation about local news—12% do so daily, compared with 6% in each of the other two cities. How do the local environments play out when it comes to civic life? Residents were asked if they are members of various local groups and organizations, such as community, parent or church groups, and if they have taken part in certain activities in the past year, such as attending public hearings or neighborhood meetings. 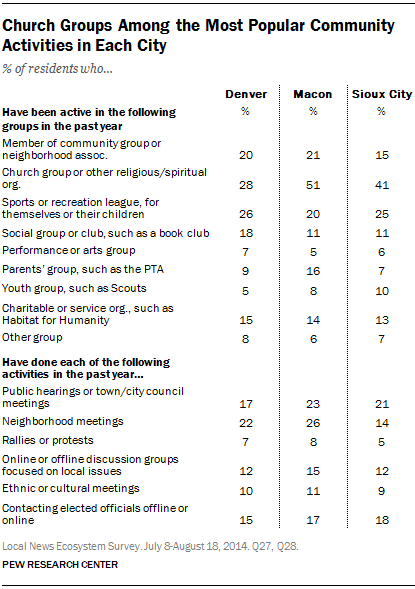 Overall, roughly a quarter of residents in each city (24% in Denver, 26% in Macon, 22% in Sioux City) are very engaged in civic life in their city—being members of or having taken part in four or more of the 15 groups and activities asked about in the survey. About the same share (28% in Denver, 27% in Macon, 30% in Sioux City) have not taken part of in any of the groups or activities. As discussed below the most engaged in each city show stronger connections with local news. Residents in each city also expressed a similar sense of empowerment over making their city’s future better. Despite starting out with very different rankings of their cities as place to live, roughly a quarter of residents in Denver and Macon feel they can have a big impact on making it a better place to live. Sioux City residents fall slightly behind at 17%. 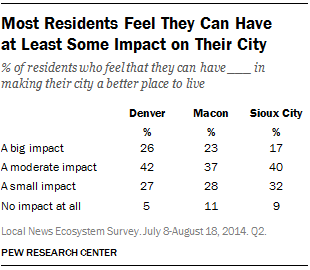 Few residents in any of the cities feel they can’t have any impact at all (5% in Denver, 11% in Macon and 9% in Sioux City). 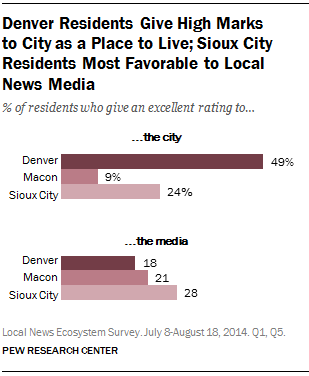 Denver residents are by far the most likely to give their city an excellent rating, but it is Sioux City residents who express the greatest satisfaction with their local news media. These residents are also the most likely to have had contact with a local journalist, suggesting perhaps that the interests and expectations of news media in a small, close-knit area are different from those in a sprawling and growing city. Overall, half of Denver residents (49%) say that the city is an excellent place to live. That is true of just a quarter (24%) of Sioux City residents and a mere 9% of Macon residents. Instead, 43% of Macon residents describe the Macon area as a fair or poor place to live—about six times as many as in Denver (7%) and more than twice that of Sioux City residents (19%). Residents’ views of the job their local news media are doing stack up somewhat differently. Sioux City residents are the most likely to think that their local media do an excellent job of meeting the needs of their local community—nearly three in ten (28%) express this view. Macon residents come in just behind, with 21% saying their local media do an excellent job meeting the needs of the community (two times as many as give the city overall an excellent rating as a place to live). In Denver, despite having a wider array of news and information options, residents are not as satisfied with their local news media as they are with their city. Just 18% say the local media do an excellent job of meeting the community needs, on par with Macon residents and lower than those in Sioux City. or offices with which they have a personal connection, such as rating their local congressional representative higher than the institution of Congress overall. Along those lines, while only a minority of residents in each city say they have ever spoken with or been interviewed by a local journalist, it is least common in Denver, where 16% report having spoken with a journalist, compared with 23% of Macon residents and 29% of those in Sioux City. Nevertheless, majorities across the board say that all in all, their local journalists are mostly in touch with the local community: 71% in Denver, 69% in Macon and 83% in Sioux City.